"I have been in the middle of converting my movie collection into MKV package. But I found MKV can't be played on my iPad so I converted number of movies into MP4. What are the differences between MKV and MP4? If I backup movies as MP4 files am I making sacrifices in quality? Hoping that I did not screw pooch these days..."
Although many users may have to convert their videos into other formats sometime, the world of video formats can be pretty confusing to them. Actually, it's nothing new that users can hardly figure out the right format from MKV and MP4, two most common video formats. Here this article gives detailed information about the two video formats to help you choose the one better suits your need. No.1 fast video converter allows you to convert any video among MKV, MP4, AVI, WMV, FLV, MTS, AVCHD, etc on Windows (10/8/7) and Mac (macOS High Sierra or below). World's No.1 fast speed and no quality loss during video conversion. MKV, the file format for Matroska Multimedia Container, is an open standard free container format, a file format that can hold an unlimited number of video, audio, picture or subtitle tracks inside a single file. It is intended to serve as a universal format for storing common multimedia content, like movies or TV shows. MKV can hold all of the same digital elements of MP4. It can also compress high quality videos into smaller files. Related: top free MKV player, MKV codec, convert MKV to MP4 format. Related: Free MP4 video converter, compress MP4 file size, best MP4 player for Mac. 5KPlayer - The silver award winner on Softonic free player downloads in U.S. 100% free video player to play MKV, MP4, AVI, FLV, MOV, 3GP, WMV, AVCHD, MTS, MP3, AAC, etc. Free download video music from 300+ sites, alongside with free media streaming feature. Can be played on almost all the major media players. Can't be played on almost all the portable devices. Good video quality, through not as good as MKV;Supported by almost all OS, players & mobile devices;Commonly used for sharing video files online. MKV supports H.264/AVC which is needed for efficient HD content playback. This makes it the preferred format for HD videos and Blu-ray rips. Costs more system resources when editing MP4 videos. The size of the file can be quite large. Due to the support for the additional features, MKV tends to be larger in size than other container files. Note: If you want to convert your videos to MKV or MP4, you can accomplish your task with MacX Video Converter Pro. 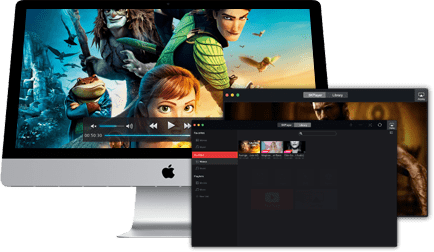 Built in 370+ video & audio codecs, this video converter for Mac can convert MKV to/from MP4 as well as transfer among HD/4K videos like MKV, M2TS, MTS, TS, AVCHD and MP4, MOV, FLV, WMV, AVI, etc with no quality loss and out-performs other competitors up to 5x faster, thanks to the only support of level-3 hardware encoding technology. Also compressing and converting MKV or MP4 video to iPhone 7/7 Plus/6s/6s Plus, iPad Pro/mini 4 is a piece of cake to this feature-rich HD video converter. 1. 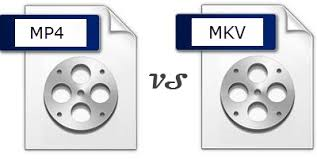 MKV is mostly used to store compressed movie files and it's suitable for those who want to get high quality videos (convert HD videos and Blu-ray). 2. MP4 is a compression format/container typically used to get movies into a format for portable players (such as ipad/ipod/iphones). 3. MP4 has more compatibility but lesser quality, while MKV has better quality but larger space and poor compatibility. Different video formats have their special purposes to satisfy various users' needs. Which one is the most suitable one depends on your own specific requirement. Though confusing and complex the format field is, you only need to concern yourself with a few. Through the brief comparison between MKV and MP4, you are expected to have deeper understanding of them to better choose the one you really need. If you are not especially fussy about the quality, here MP4 is highly recommended as it is mobile device friendly and has relatively good quality. This is a step-by-step guide to show you how to rip and convert DVD to MP4 (MPEG-4) format on Mac (El Capitan and macOS Sierra included) with free Mac DVD ripper. So that you can import DVD to iPhone (iPhone 7/6S/6 Plus), iPad (iPad Pro/Air 2), iPod, iMoive, iTunes etc. Any free MP4 video converter to convert 4K/8K 1080P videos to MP4 free? The best free MP4 converters to convert videos to MP4 free like MOV, MKV, AVI to MP4 with the top quality is shared here.